Since she was a toddler, Kathleen, one of our three daughters, has had a hankering for “pasta with pesto.” The pasta, while important to most main dishes, takes backstage to the basil-rich pesto in our household. The pasta can be any variety of penne, angel hair, linguini, spaghetti, rigatoni or fusilli. The pasta is also the last thing to be cooked. Once boiled in hot water for the right duration and cooled and bathed in olive oil (to keep it from clumping and sticking), it is ready for the infusion with the sauce. In our kitchen the magic comes from the pesto. Pesto is a great end-of-summer treasure, because in August the basil is at it’s peak (has flowered by not gone to seed), and it can easily be rinsed, clipped and chopped. The local farmer’s market sells us basil by the box and we chop up a batch ready for freezing, which is a real bonus. Frozen pesto preserves it’s flavor for many months and carries us over to the next summer, when we start again. Many years in a row our “go to” Christmas gifts for our friends and neighbors consisted of pesto and a bottle of wine. Those gifts are often accompanied by a January request for the pesto recipe. As to freezing the pesto it is best to use gentle thawing (do not put in the microwave, as it will liquefy the cheese). When thawed gradually the pesto is brought to its original freshness for your favorite winter and spring dishes. While my mom was not a particularly good cook, my sisters Eleanor, Millie, Nancy, and Mary are gourmet’s. They all know their way around a kitchen and cook fantastic varieties of dishes from around the world. The following recipe is my version of a recipe from Millie. She outlines a near fool-proof way to make pesto for dips, spreads, dressing, or just about anything. It tastes good on a tomato drizzled with olive oil and a touch of salt. The concept is to combine the main ingredients (basil, cheese, nuts, and oil) in near equal proportions. The texture and consistency will vary, but so will the fun experimenting for the flavor and aroma that suits your tastes and those of your family best. Below is one that has worked for our family for about 20 years. Pinon nuts (or walnuts) – about 5 pounds. Please note that pine or pinon nuts (which can cost up to $40/pound) are very expensive, so, as a substitute we use raw walnuts instead. It lowers the overall costs of the pesto and has a unique flavor that works well with my family’s wallet and pallet. 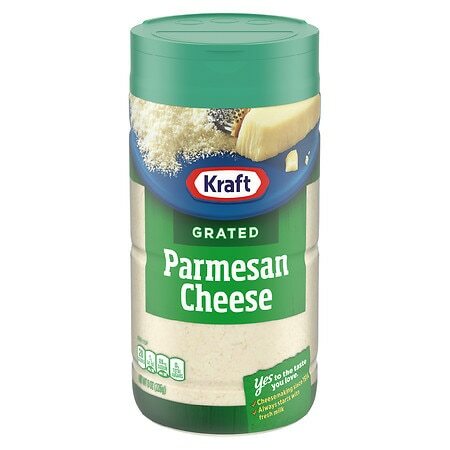 Parmesan Cheese – about 5 pounds – grated Kraft has proven great for us. You may want to experiment with your favorite store brand, or your exotic hard cheeses. Artisan Reggiano Parmesan is a popular choice, and other hard cheeses from around the world add great flair to your particular taste in pesto. 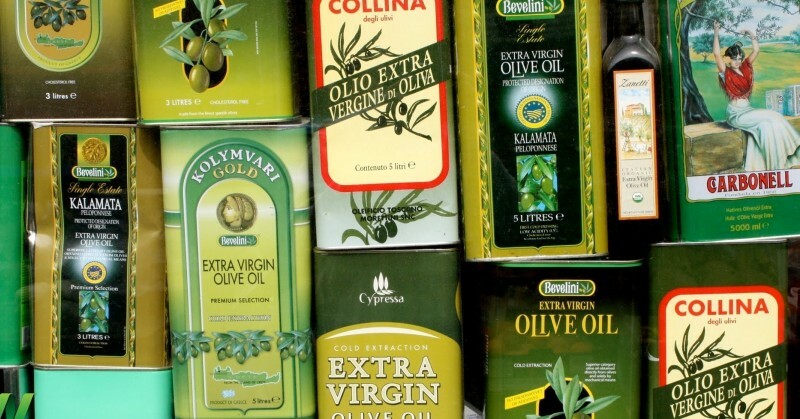 Olive Oil – about two quarts of oil. The choice of oil is key to the flavor and end cost of your pesto. Go for Extra Virgin, Cold Pressed, or First Pressed oils as they seem to work best in these recipes. Oils that are not extra virgin and those labeled as “lite oil” seem to lack the overall balance and flavor we enjoy in our pesto. Garlic – two whole garlic to yield 20 or more cloves to taste. These will be chopped along with the pine nuts or walnuts to make sure they don’t clump and give you family dragon breath. Have the basil, nuts, garlic, cheese and oil ready to go. You will want to have a Cuisinart or other chopping device, a large mixing bowl and a wooden spoon. 1. Wash the basil in the kitchen sink and shake the moisture and set aside for chopping. 2. Using your fingers or kitchen scissors, clip the basil leaves and soft stems from the large stems. Chop the stem/leaves to a fine leafy liquid in a Cuisinart or similar grinding device. Some people only use the leaves, but I find there is a lot of flavor in the stems. Be careful to cut off and discard any stems that are mature, brown and hard, as they will make the basil stringy and hemp-like. Place the chopped basil in a large mixing bowl that can handle over 4 times the amount of basil. 3. Chop the nuts in the same Cuisinart along with the garlic. Be careful not to chop too long, as the nuts will turn to a paste. Our family likes having chunks of nuts in the final pesto, so we leave some of the nut pieces nearly whole for the mixing bowl. Put the chopped nuts / garlic along with the chopped basil in the large mixing bowl. 4. 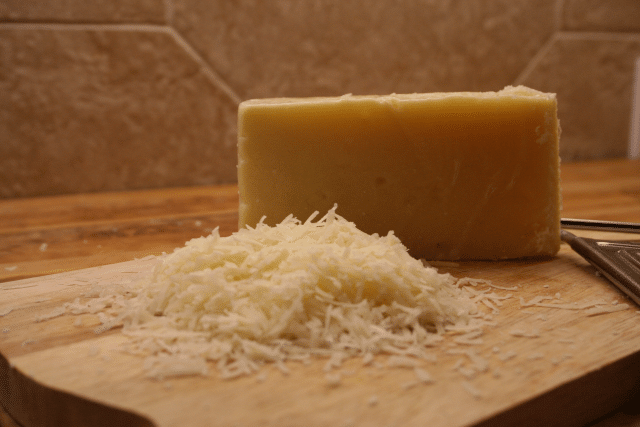 Chop the Parmesan cheese (if not chopped already) and add the cheese to the mixing bowl. 5. Lastly add the olive oil, pouring in about half of the oil, mixing with a wooden spoon, then slowly adding in the last half of the oil. The consistency we like is that of wet cement. The color is that of dark green chinking. The amount of oil is a personal preference: if you want a more liquid consistency, then add more oil. If you want it firmer, then add less oil. Set aside the pesto you want to eat immediately. What Else to Make a Meal? 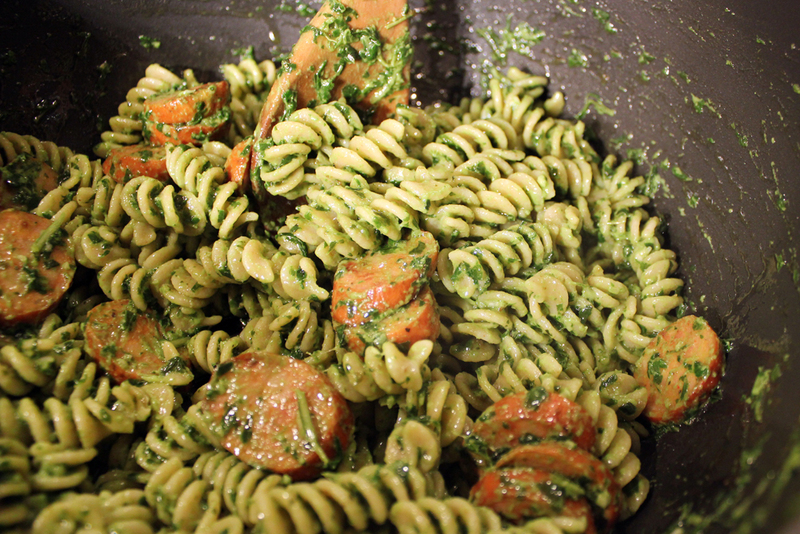 Pasta with pesto is always a hit, either as a main dish, appetizer or side dish. Our daughters will eat it for days, even cold when chilled overnight in the refrigerator. To spice it up and for variety, we add chopped red peppers and tomatoes (for color) and small cubes of roasted chicken (for meat eaters). We also love pesto on our favorite ravioli, vegetables (carrots and asparagus are always a hit) and it is a great base for toast and your best bruschetta. It tastes great on Italian and French bread, cooked eggs (any style), crackers, to cheese spreads. Again be careful when you reheat the pesto, as the cheese will get runny when it is heated in the microwave. We find it is best when we cool the pesto to room temperature and use the natural warmth of the heated pasta to further soften and blend in the pesto. Fill freezer friendly plastic containers with the pesto. Be sure to leave room at the top for the contents to expand in the freezer. About a half inch space from the lid should be sufficient. If the containers are too full, the oil will escape and freeze into yellow globules outside of the container in your freezer. Some chefs know that they will be using the pesto in a few days and they freeze the pesto in ice-cube containers. This is a great idea, as it puts the sauce in easy to use cubes that can be added to or reduced, depending on the dish you are preparing and the number of guests. Be careful not to leave these trays in the freezer too long, however, as the cubes can get freezer burn if left too long. Love this recipe! We’ve been lucky to receive your pesto as a gift and eat it in your home. Yum. Thank you for creating a user-friendly and colorful recipe even Ina Garten (Barefoot Contessa) would be proud to share.